I Surrender! Let’s Pumpkin Spice ALLLL the Things! | I'm Gonna Cook That! I Surrender! Let’s Pumpkin Spice ALLLL the Things! The gentleman behind the counter assured me it’s delicious, but I just can’t get on board. Sorry. However, there is a time and place for pumpkin spice things, and in my humble opinion, breakfast is one of them. A pumpkin-y breakfast is a great way to start your day! Did you know that 1 cup of mashed pumpkin contains 200% of your recommended daily Vitamin A? PLUS, it has beta-carotene, the stuff that makes it orange, which your magnificent body changes into even more Vitamin A. Know what Vitamin A is good for? Your eyeballs. Especially when they need to see in low light, say, when you’re waking up at 6am in the winter. Anyhoots, what I’m saying is, eat some pumpkin in the morning. Do yourself a favor. 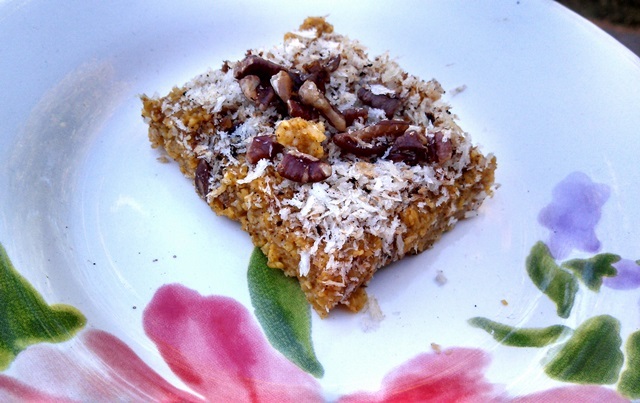 Maybe you could try these pumpkin polenta bars? They’re pretty easy to put together the night before, and one batch should last you at least a couple of days, and maybe all week, depending on how many people are eating breakfast at your place. Preheat your oven to 350°. Butter the pan lightly all over the bottom and at least halfway up the sides. Set aside. In your pot, combine the water and maple syrup and bring it to a boil. Add the polenta, sprinkling it in a bit at a time as you stir to avoid lumps. When all the polenta has been incorporated, lower the heat to a simmer and stir for about 10 minutes, until the mixture thickens. Add the pumpkin, cinnamon and sugar, and stir it all in well. NOTES: 1) Polenta gets hot… like molten lava hot, so keep your heat low and don’t stand right in front of the pot or you’ll get splattered and that’s not fun. 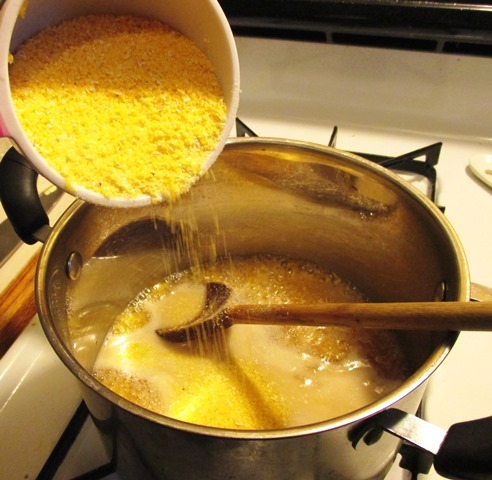 2) Make sure you are stirring pretty constantly to avoid scorching. If you need to walk away from the pot for any length of time, go ahead and remove it from the heat until you can get back to it. 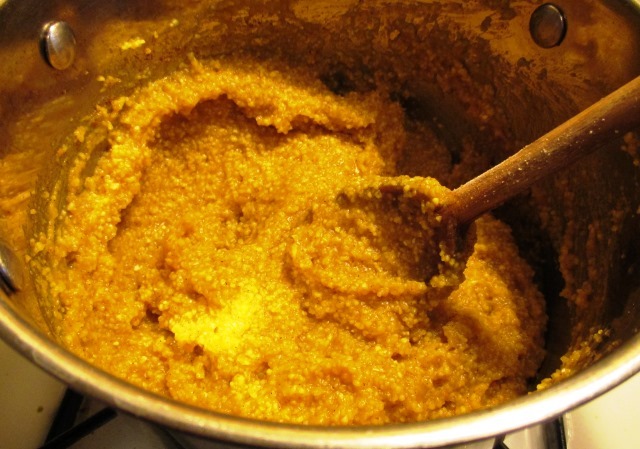 The polenta will keep thickening without the heat. If you come back and it’s a little too thick, just add a little water back in to loosen it up and keep stirring until it’s cooked. 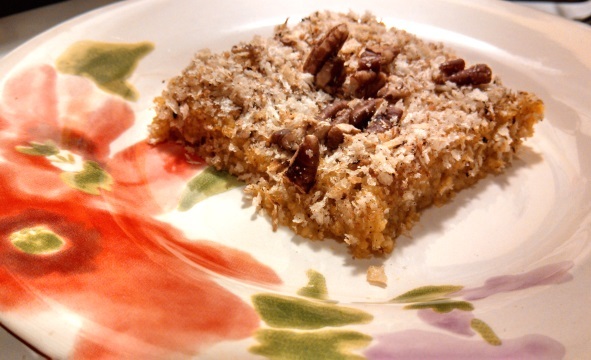 This isn’t an overly sweet breakfast bar, but at this point you can taste the polenta and adjust the sugar and cinnamon as you see fit. Continue stirring until the polenta is thick, but not stiff. It should still be loose enough to spread into your pan. Pour the polenta into your buttered pan and spread it around to even out the thickness. Set aside. In your saute pan, melt 1 tablespoon of butter over medium low heat until the bubbles have subsided and it just starts to brown. 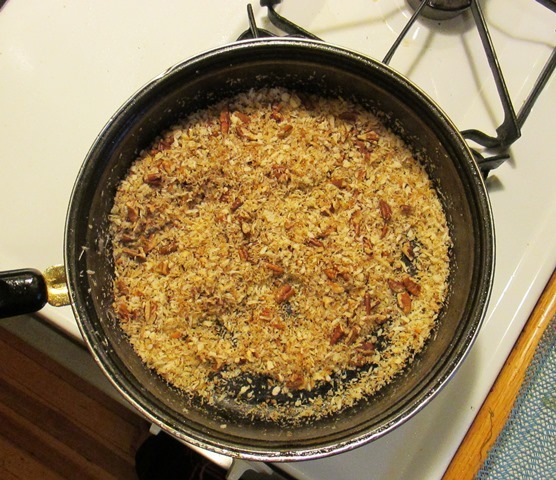 Add the panko, the nuts, and the remaining 1 tablespoon sugar and stir to combine with the butter. You’re basically just trying to toast the panko and the nuts slightly. Top the polenta with the panko mixture, and pop it into the oven for 15 minutes. The polenta won’t brown. You’re basically baking it to set it up so it can be cut into bars. Take it out of the oven, let it cool, cut it into squares, and viola! 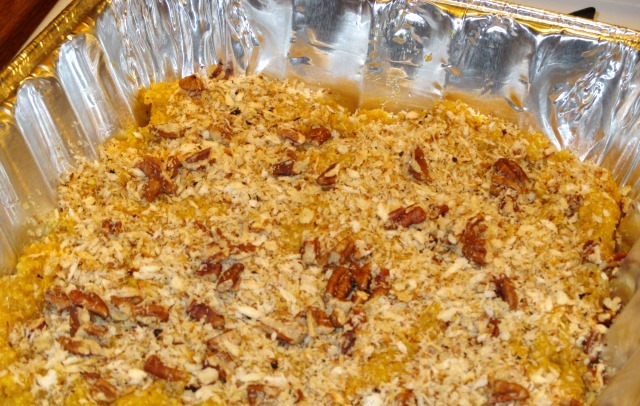 Portable Pumpkin Polenta! ← IFBC: When The Universe screams in your ear, you better listen. I’m totally falling into the pumpkin trap…these looks great! I like your writing style, and I love pumpkin. This looks good.